Increasingly, consumers are looking to buy meat and animal products that have been raised humanely. 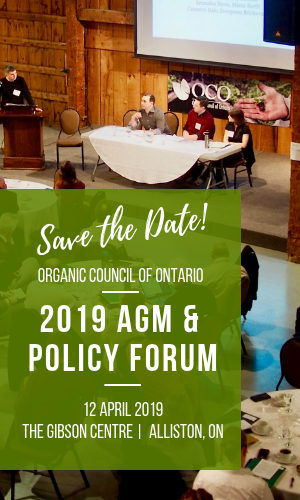 While the National Farm Animal Care Council (NFACC) has developed codes of practice for animal production in Canada, other standards — including certified organic production — go further. For instance, the Society for the Prevention of Cruelty to Animals has developed an “SPCA Certified” program. Originally implemented in British Columbia, the program has more recently been extended to Ontario. The standards are higher than those of the NFACC and in many cases, are similar or equal to organic certification requirements. The BP SPCA provides a useful comparison chart here. Similarly, Humane Farm Animal Care has developed the “Certified Humane” standard. It offers very specific requirements for outdoor space and time for birds, as well as limits on stocking density for cattle, among a host of other rules. These standards reflect many of the practices and intentions of organic, but provide more detailed guidelines on feed, space, heat, ventilation and other aspects of animal treatment. 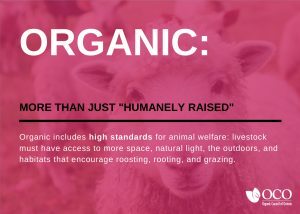 It is possible to certify as both “organic” and “humane”. As part of a systemic approach to agriculture, organic requires humane treatment of animals in a broader context of care. 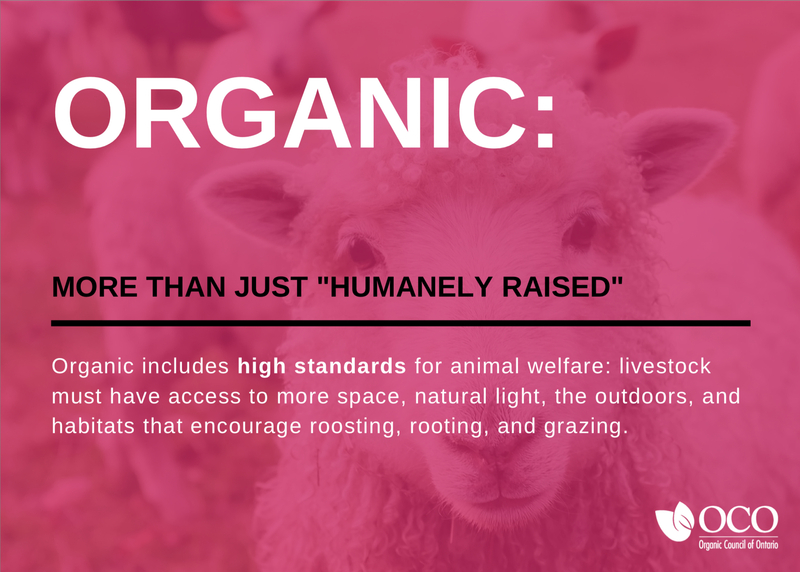 In general, organic includes higher standards for animal welfare: livestock must have access to more space, natural light, the outdoors, and habitats that encourage roosting, rooting and grazing. But organic provides a higher standard of treatment that also incorporates restorative and sustainable agricultural practices. Under a system of organic production, livestock are provided with living conditions and space allowances appropriate to their behavioural requirements and organically produced feed. These practices strive to minimize stress, promote good health and prevent disease. In this post, we look at different claims made concerning animal treatment and explain in particular how organic practices apply. Specifically, we will discuss space, feed, transportation and medical regulations for organic producers. It’s important to remember that organic production considers each element as part of a whole — one that seeks to minimize negative effects and promote sustainable, systems-wide practices. Indeed, raising livestock can play a key part in organic production through soil building, nutrient cycling, and weed and pest control. We should emphasize that Canada’s organic standards for animal treatment are different from US standards. Recently, the United States Department of Agriculture not only rejected more stringent rules for animal treatment, but arguably loosened its interpretation of organic standards to allow for treatment that is equivalent to conventional farming. When it comes to eggs, there are a number of different phrases used to describe the living conditions for hens. “Cage free” and “free run” refer to poultry not being kept in battery cages (which is currently standard industry practice), but in open-concept barns. These approaches let hens run free (indoors) and ideally have access to nests and roosting spaces. Neither of these designations indicate whether or not hens are allowed outdoors — commonly referred to as “free range”. Egg-laying hens often live in fairly close quarters. In Canada, upwards of 90 per cent of hens are raised in cages. Under new NFACC guidelines, however, cages are being phased out, and the organization estimates that over the next eight years, half of all hens will be raised outside of traditional cages. “Enriched” cages will have perches and nest and scratch areas and will provide more room than battery cages — from a bit less than nine by nine inches to about 11 by 11 inches of space per hen. In Canada, federal organic standards prohibit the use of battery or enriched cages and set indoor densities at a maximum of six laying hens per square meter (about 16 by 16 inches per hen), while outdoor runs require more space, at four laying hens per square meter (about 20 by 20 inches per hen). 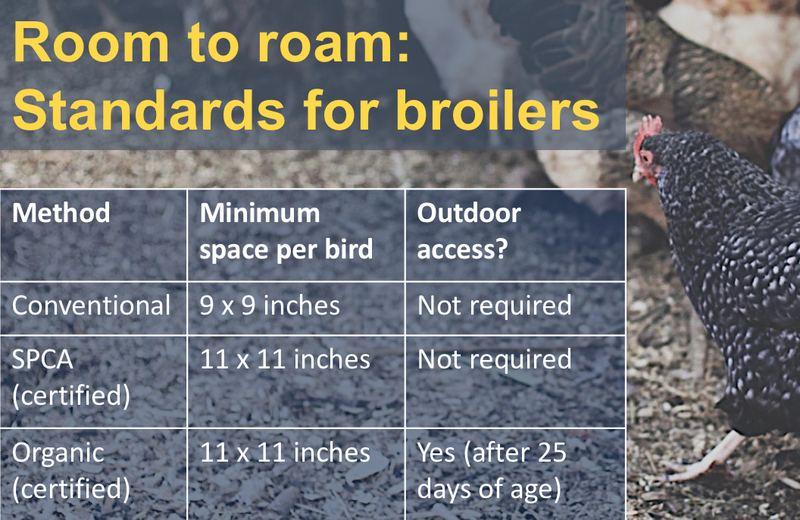 These standards also limit laying flock size to 10,000 hens and mandate that hens have ready outdoor access (although more than one flock is permitted in the same building, so long as they have separate runs). Here, organic certification ensures that hens are raised in free-range conditions (weather permitting). The federal organic regulations also lay out rules for natural light in poultry housing. Window area must equal at least one per cent of the total floor area — or failing that, natural light in the barn has to be bright enough to read a document like a newspaper. The standards for broiler chickens (meat birds) are slightly different. 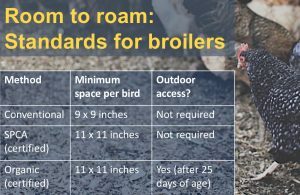 While most conventional and organic broilers are raised indoors in open floor barns due to biosecurity and quota rules, SPCA and organic standards require more space per bird (both call for about 11 by 11 inches per bird versus nine by nine inches for conventional practices). Organic standards also require that broilers have access to outdoor space by 25 days of age. The standards set minimum sizes for pop-holes (the exit to the outdoors) and maximum distances from chickens to pop-hole, to encourage outdoor access. In some cases, smaller, diversified farms also use movable runs to pasture broilers outside. This is becoming more commonly allowed in Ontario under the new Artisanal Chicken program that many organic farmers participate in. COR regulations draw a direct line between livestock and access to land. For cattle, this includes providing access to pasture during the grazing season, as well as outdoor access at other times (weather permitting). Each animal unit (one fully grown cow or bull) also requires 0.33 acres for grazing. Stocking rates must also take into consideration local conditions and not have a detrimental effect on the environment. Pigs must also have access to outdoor spaces, which should include pasture. 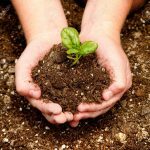 Both indoor and outdoor spaces shall also allow for rooting. COR regulations stipulate a maximum of one sow per acre, “based on a balance between animal units, feed production and manure management”. Indoor space requirements for boars, sows and piglets also tend to be greater than industry minimums. Under the Canada Organic Standard, animals must be treated with care, and stress and suffering must be minimized. While organic producers must follow the same rules for transporting farm animals in general, the use of electrical prods is prohibited. Transportation times must be as short as possible, which means for instance, that if two slaughterhouses are available, the closer one must be used. 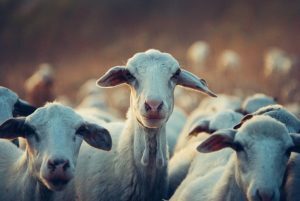 While giving medicine may affect an animal’s organic status, producers are barred from denying treatment in order to keep them certified organic. We’ll look at antibiotics, vaccines and medicines in a future blog post, but in general, sick animals must be treated — and treated quickly — even if it means they can no longer be certified organic. As well, only organic regulations require that animals be supplied organic feed, unlike other animal welfare standards. [B]eak trimming of birds, tail docking of pigs and trimming of needle teeth in piglets are permitted when they are necessary to control problem behaviour that has a negative impact on the welfare of other livestock. Operators shall document the other measures taken to control or eliminate problem behaviour. 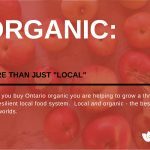 In Canada, organic certification requires taking a number of additional steps towards raising animals humanely. Space, feed and treatment are all based on understanding the needs of animals themselves, as well as the environment in which they are raised. Organic standards address many concerns people have about where their food comes from and how it is produced. Better treatment of animals is one way that organic improves food quality and reduces the negative effects of food production. Choosing organic, and especially Canada Organic, is choosing a more humane treatment of animals. Many thanks to Rob Wallbridge for providing detailed information and clarity required for this post.